[London: 9 April 2018]: On Saturday 19th May, Embassy Gardens will host a pop-up bouquet making workshop as part of Chelsea Fringe. Hosted on the marketing suite roof terrace and orangery, attendees will be able to learn a few floristry skills whist overlooking part of the beautifully planted linear park and new US Embassy ornamental lake. The event coincides with the release of a collection of new apartments at Embassy Gardens. The new Suites, 1, 2 and 3 bedroom apartments place residents at the heart of London’s most exciting new neighbourhood, adjacent to the iconic US Embassy building and the landmark development scheme in Nine Elms. With prices starting from £750,000, each home is designed with health and wellbeing at its core, providing an enviable escape from the vibrancy of London’s South Bank. 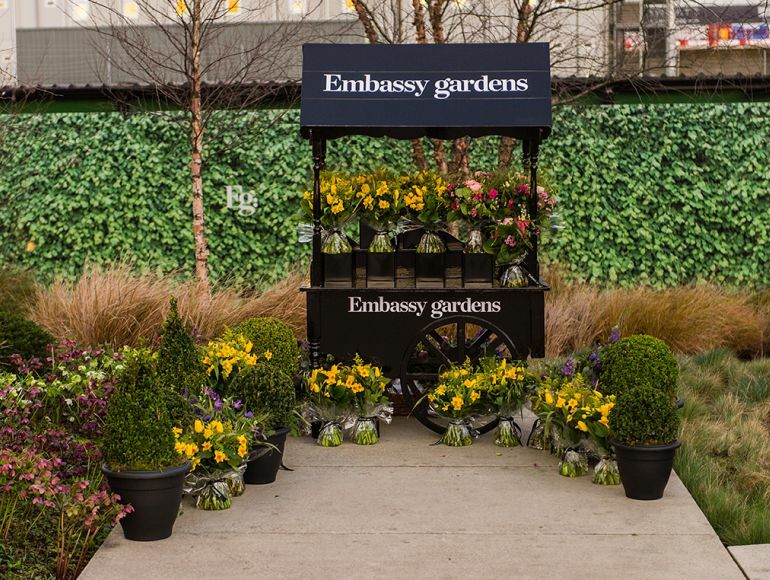 Taking place between 11.00am and 4.00pm on Saturday 19th May, guests are invited to a botanically-inspired event, to find out more about life at Embassy Gardens and to take part in their own horticultural masterclass. Two hand-tie bouquet making workshops, courtesy of Lucie Mason Flowers, will take place throughout the day (email events@ecoworldballymore.com to book a space), while a cart stocked with beautiful spring posies will showcase Embassy Gardens in full bloom. Seasonal sweet and savoury treats, all incorporating floral and botanical elements, will be available throughout the day, along with fresh juices. The Chelsea Fringe Festival (19th – 27th May 2018) seeks to bring together green-fingered enthusiasts across London, providing a platform to spread the love of gardening far and wide. Like Chelsea Fringe, EcoWorld Ballymore seeks to harness the creative energy of gardens and gardening thought its development projects. Embassy Gardens is designed to provide a tranquil and relaxing living environment for residents and visitors, incorporating a variety of green and open spaces from intimate garden squares to a private ravine. All communal areas will be beautifully landscaped, incorporating wildflowers and foliage to create a unique place of respite. The ground floor green spaces sit within the new linear park, which will form a green ribbon for the area, linking Vauxhall to Battersea Park via Embassy Garden’s Union Square. Once complete, Embassy Gardens will provide nearly 2,000 new homes for Londoners, with each home designed with quality craftsmanship at its core. Apartment interiors contain a plethora of handcrafted details, making use of light-coloured oak, marble and black granite to ensure the highest quality finish in every new home. Taking influence from Soho-loft style living, natural light will flood the apartments through floor to ceiling glass windows and open plan design creates a sense of space. The breath-taking Embassy Gardens Sky Pool will be the pinnacle of residential amenities at the development, enabling residents to swim between two residential buildings while providing a totally unique view of the capital through its transparent walls. Similarly, all residents will become members of the EG:LE club, an exclusive private members club which includes a private screening room, gym, yoga studio, therapy room, traditional library, lounge area and business suite.